Whispers in the Loggia: Gotham's "Spiritual Mother"
Earlier in the week, it was noted that one member of Archbishop Tim Dolan's sizable orbit playing a role in his New York installation next week will be his second grade teacher in Ballwin, Missouri, Mercy Sr Mary Bosco Daly. To the millions of Catholics in New York, he'll be known as His Excellency - but Sister Mary Bosco Daly still calls him Tim. Archbishop Timothy Dolan may be taking over the most visible job in the Catholic Church in America, but he hasn't lost sight of where his spiritual calling blossomed - or the Irish nun who planted the seeds. 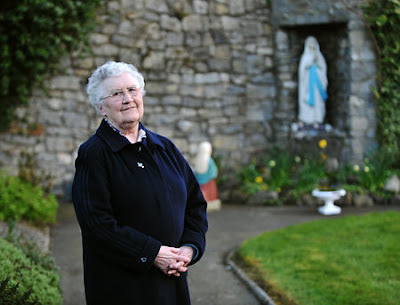 "She's remarkable," Dolan said of his "spiritual mother," who taught him in second grade in small-town Missouri and now lives in County Louth, Ireland. Their long friendship began when Dolan was 8 years old and a student at Holy Infant Grade School in Ballwin, Mo. Daly, then in her 30s, had moved to the Midwest from Ireland to teach. The way Dolan tells it, she sounds a bit like the Ingrid Bergman character in "The Bells of St. Mary." [sic]. "She was the kind of woman that even in full religious garb would still be out in the playground kicking a soccer ball," Dolan said. "She wanted the boys to teach her basketball." Her interests weren't limited to schoolyard athletics. Daly also loved drama and art and taught the girls Irish dancing. "She's a loving, gracious woman and an excellent teacher," he added. "I just admired her so much." Although Daly will only say she's "on the wrong side of 21," Dolan, 59, reveals she's 84 and in excellent health. Since the second grade, she has been a fixture in his life - attending his confirmation, his first Mass and a meeting with the Pope in Rome. She was there again when he was installed as archbishop of Milwaukee in 2002. They last saw each other in 2007, when Dolan invited her to Thanksgiving, but she's never far from his mind. "The prayers she taught me in second grade I say every morning," he said. "And she said the last prayer on her rosary is for me. I told her to put a few more on these days," he joked. On her last trip to Milwaukee, Dolan interviewed Daly for his weekly TV show there. In its preview article for the two-day rites, the News said that no less than "the world is coming" to party as Gotham's tenth archbishop takes office. Few, if any, truer things have ever been said. But for those unable to make it, just know that both the city's major TV outlets and EWTN will be going all out, both preempting regular programming on the air and devoting their webstreams to carrying the festivities live (and, hopefully, on-demand, too). More details as the days approach. Indeed, it'll be quite the moment. And through the coverage here, you'll have the best seat in the house... with all the news that's fit to print. After the intense journey of Holy Week, kick back and stay tuned for a raucous Easter Week on the beat... and as road coverage tends to do a number on the house budget, thanks to everyone who's remembered the Guitar Case.